This is our brand new and beautiful bending wooden stool.This set is just the right height for little children to sit on while they have a great time playing and learning. No sharp corners so kids won't catch clothes or ties. They are sold in sets of four and made of birch . It takes just a few minutes to easy assembly.Don't hesitate to buy it now! 【Multi-Function】With simple and sleek look, our wood stools with natural finish blend into virtually any decor. These stools are ideal for your kids or students when eating, reading, having class, and more. 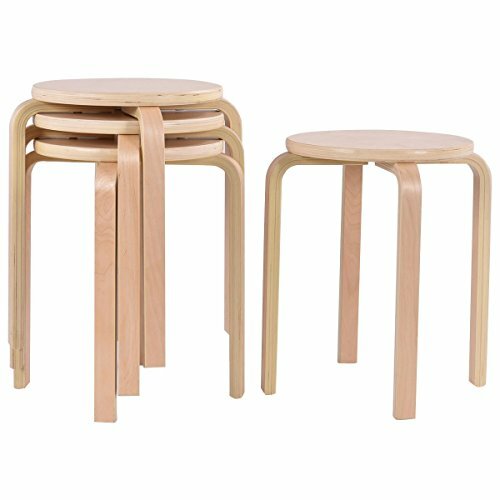 【Premium Design】Constructed with high quality wood, our stools are sturdy and strong for daily use. Natural and smooth finish, rounded corners, protects your family from being scratched, especially the children. 【Space Saving】Their compact shape and stackable design can help you save much space for storage, especially for events, party or commercial use. 【Easy Handling】These stools are very easy to assemble if you follow the every step of the instruction included in package. And they are also easy to clean, you can just wipe it using dish washing agent and a damp cloth. 【Shipping & Customer Service】Ups or usps will deliver the item to your house in 3-6 business days after you placed an order. We packed patio furniture as good as we can, if there is any part missing or damaged during shipping, please contact us first and offer us pictures of damaged part, we will solve the problem as the way you want(replacement at no charge or discount).